As we covered in our guide to buying the best car vacuum cleaner, car vacs are typically powered in one of three ways: with a standard cord and outlet, a 12-volt cord and cigarette lighter plug, and cordless (i.e. battery powered). The best style of car vacuum depends on each person’s preferences, but a cordless car vacuum clearly offers the best maneuverability around the vehicle as you don’t have to worry about being tethered to an outlet. 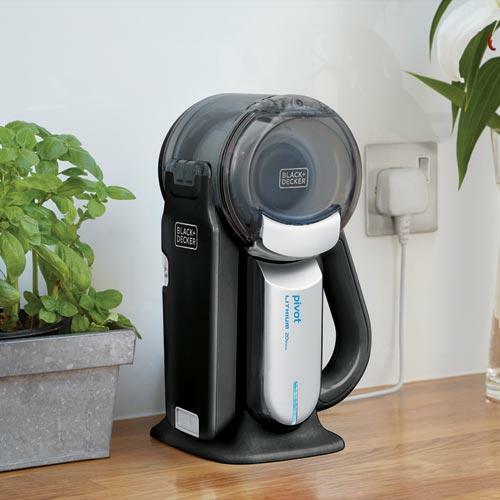 Naturally, there is a tradeoff with suction power and the length of time you can run the vacuum at once, since the power is supplied from a battery, but if you choose the right vacuum you should still have plenty of suction power thanks to recent technological advancements. Lithium-ion batteries have revolutionized consumer electronics and are found in everything from mobile phones to Tesla electric cars. 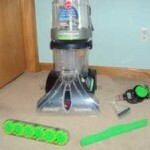 Fortunately, vacuum companies have begun manufacturing their cordless vacuums with lithium-ion batteries as well, and we have much stronger, longer lasting and reliable handheld vacuums as a result. Only recently has this been possible, so if you are used to an unreliable rechargeable handheld you may want to try out one of the new cordless handheld vacuums. We’ll overview some of best right here. Before we go into any more detail, here’s a quick comparison table that examines a few defining characteristics of some of the best cordless car vacuums. Hopefully the comparison table above is a useful tool for quickly looking through some of the best cordless car vacuum cleaners available today. One of the most important things to note is the battery type. As we’ve mentioned above the best type of batteries for cordless vacuums is the newer lithium-ion batteries. You’ll likely want to stay away from the nickel cadmium batteries, because after sitting on the charger for too long they will actually slowly lose their capacity to hold a charge and the vacuum will get weaker and weaker over time, an issue that lithium-ion batteries do not have. 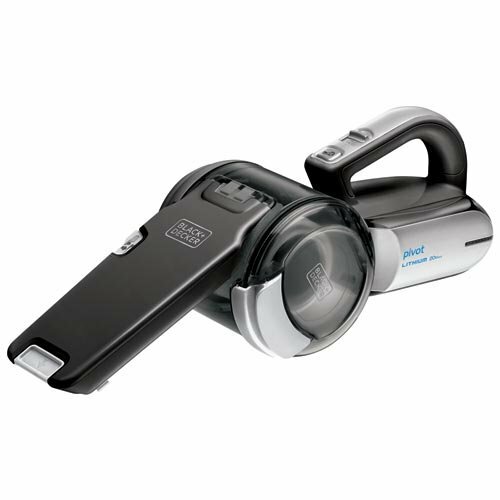 The Black & Decker MAX Lithium Pivot vac is the best cordless car vacuum under $100. It’s really impressed consumers who are used to the Dustbuster and other handheld vacuums that used nickel cadmium batteries and slowly eroded in quality over time. The MAX Lithium Pivot is max quality. Two of the best cordless car vacuums currently available are the Dyson V6 Trigger and the Black & Decker Max Lithium Pivot Vac. Both offer a very stylish aesthetic while taking full advantage of lithium-ion battery technology. The V6 Trigger even uses a customized battery that Dyson has re-engineered themselves for their new line of cordless vacuums–a nickel manganese cobalt battery, which falls into the lithium-ion family. You’ll pay for that engineering, as the Dyson V6 is by far the most expensive vacuum on this list, coming in just under $200. However, it is certainly the best as well, with very strong suction for a cordless and all the reliability that comes with the Dyson brand. The battery lasts for 20 minutes of continuous vacuuming, and the Trigger even has a Boost setting that goes all out with the suction power for tougher jobs, although the battery lasts just about 6 minutes with Boost continuously running. It comes with both a straight nozzle and a brush attachment useful for breaking up debris in your car’s interior, and what’s more is fully compatible with Dyson’s line of handheld vacuum attachment add-ons if you need anything else for your cleaning tasks. 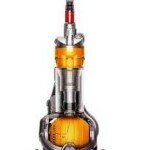 While all that adds up to a pretty expensive car vacuum, the quality of expensive cordless vacuums is a lot better than it used to be, and if your main concern is quality the Dyson V6 Trigger is a great choice. It also looks very stylish in its charging dock, which you can leave it in without any drainage of battery capacity. Coming in at less than half the price is Black & Decker’s MAX Lithium Pivot vacuum, a strong improvement over both their Dustbuster line and their other Pivot vacuums that don’t utilize lithium-ion batteries, like the PHV1810 18V model. It’s a lightweight, sleek and stylish model that even has a very cool looking charging station. It gets slightly less operating time than the Dyson V6, coming in at around 15 minutes of continuous use, and there’s not two separate suction power levels, but the suction power it does have with its 20V battery is very, very good for a cordless handheld. When buying a cordless car vacuum, chances are you’ll want a handheld that serves you well cleaning other parts of the house as well. It’s going to need a charging dock connected to a standard outlet, so as long as there’s no sacrifice in its ability to clean your car it may as well be multi-functional. 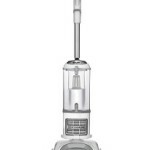 Both of the above models are very functional as a house vacuum as well, so serve that dual purpose beautifully. While we haven’t had a chance to video review the newer MAX Lithium Pivot model, here’s our video review of the 18V Pivot cordless car vacuum from Black & Decker, so you can get an idea of what the Pivot style has to offer. Read our full review of it here. And while the Shark Pet Perfect II is a bit eclipsed by the lithium-ion models now, it is still the only cordless car vacuum on our list designed especially for pet messes, so if you’re interested in it you may want to watch our video review of it below and check out our full in-depth review of it here.